An excellent introduction to the magnificent landscape and ecosystem of Argentina’s Patagonia region; the End of the World Train Railway (Tren del Fin del Mundo in Spanish) is surely one ride you will never forget. So what’s behind this railway’s intriguing name? The End of the World Train earned its name due to its geographical location. The train ride leaves just outside Ushuaia, the southernmost city in the world, and heads out to the beautiful Tierra del Fuego National Park of Patagonia. This one-hour ride not only promises a very picturesque journey through a wild and rugged landscape, it is also a tribute to the past, as the railway route the train follows (Southern Fuegian Railway) was used by the Convict Train (Tren de los Presos), about 100 years ago. The End of the World Train collects passengers from a station of the same name. This station, which is reputed to be a former prison, is specifically situated 5 miles or 8 km outside Ushuaia. 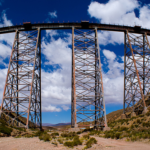 Once the train starts its journey, a bilingual guide (English and Spanish) will tell you fascinating stories about the Convict Train and the remote Patagonia region that intrigues all on board. The train route features an amazing change of scenery, which highlights rivers, lakes and lagoons, all of which eventually lead to the Beagle Channel. It will also cross a wooden bridge over the Pip River and pass through magical beach forests as well as timber-felling worksites where the workers used to be Ushuaia prisoners. The train then stops at the Macarena Waterfall Station, which is near a reconstruction of a Yamanas Indian campsite. While here, you will learn more about the indigenous Yamana tribe. The area also is also home to a vantage point, where you can climb and get spectacular views of the landscape so be sure to have your camera ready. Your “End of the World” ride will then continue on to the heart of the Tierra del Fuego National Park. The national park, which is the only one in Argentina that’s located on the coast, is popular to hiking enthusiasts as it offers several easy walking trails that highlight the beauty of bays and rivers. The train will take you through the valley going towards Ensenada Bay, where you can admire the islands of Redonda and Estorbo. Take the opportunity to walk near the shore of Roca Lake or the along the Lapataia River. The tourís last stops in Tierra del Fuego are usually Green Lagoon and Black Lagoon. 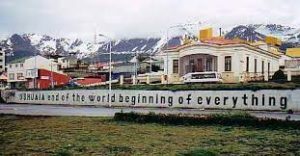 The End of the World Train tour to Tierra del Fuego usually lasts for half a day. 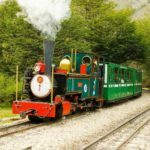 This special train service is actually offered year round, 5 times a day; so you have plenty of chances to catch one of these amazing rides while vacationing in Ushuaia. The tour costs typically includes hotel pickup and drop off. However, food and beverages are not included in the package. But don’t worry if you get hungry or thirsty along the way as the train is also fully equipped with a cafeteria and a bar! So what are you waiting for? Put this attraction on your bucket list and then “All Aboard” for this spectacular train ride to the end of the world.